Why has RF4CE become very successful in the US? After several years of use by US cable companies and internet service providers, the advantages of ZigBee RF4CE are eminently clear. Operators are quick to praise the reliability and the interactivity of RF in comparison with infrared (IR). “IR is the last technology around in the home dating from the previous century”. Maybe the biggest technical difference between RF and IR is the fact that RF enables two-way, non line- of-sight communication, where IR is only one-way (from the remote control to the set-top box or TV, but not in the other direction), and IR requires point-and-shoot. 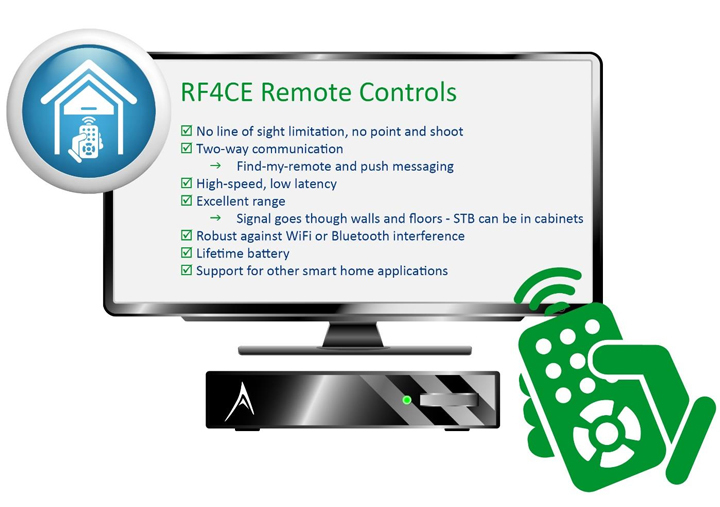 As the RF4CE remote does not have to be aimed at the device like IR, pointing the remote at the device is no longer required. This means that the set-top box or home gateway can be hidden behind the television or in a closed cabinet. The RF reliability is important. Like its sister technology WiFi, RF4CE can cover an entire home so the set- top box does not need be in line of sight of the remote control. It does not even have to be in the same room as the TV, entertainment center, or other controlled devices. By using RF4CE, which requires very little power to operate, battery life is significantly improved and can even exceed the life of the remote control. Longer battery life is an important feature for the operators because many customer service calls are generated just because of dead batteries in the remote. Reducing service calls for problems like these can significantly reduce the operator’s costs and maximizing profits. Long battery life is an important reliability feature for the operators. RF4CE can also function in a hybrid model – supporting both tomorrow’s RF connected devices as well as legacy IR devices. Many TV makers are shipping dual operation remote controls that support both technologies. Interactivity is also key. One good example for consumers is the so-called “find-my-remote” feature. By simply pushing a button on the set-top-box, the remote control starts beeping or flashing, making it easy to find. For the MSO, RF4CE’s interactivity enables an easy way to update the software in the remote control at the customer’s house, in the same way as software in the set-top box is updated. This can be very useful – further reducing service calls and customer inquiries. By downloading software, a RF4CE remote control can essentially automatically configure itself. In addition, the RF4CE remote can download new software control codes enabling it to become the IR-remote control for the TV or any other IR-based legacy device. This interactive, two-way communication also allows for push-messaging. This is when service providers push messages (which can be sales offers as well as Amber Alerts or tornado warnings) that appear on the remote control’s display screen for direct interaction with the end-user. This is yet another great opportunity for operators to offer valuable services even when the TV is switched off. Because the bandwidth of RF is significantly higher than with IR, another advantage of this interactivity is that the RF-based remote control can also support voice commands. This enables consumers to formulate queries and speak them towards the remote control’s microphone (“show me all the recent movies with Scarlett Johansson”). Commands get compiled by a voice recognition database and are executed accordingly allowing the consumer to pick and choose from a list displayed on the TV. Remote controls using RF enable a wide range of new usage models and business opportunities for the operators. Additionally, RF also opens the door to device and system developers who are looking for an entrance to the exploding Smart Home market in Europe. ZigBee RF4CE is a standard networking and application protocol especially targeted to the remote control application. Besides the above-mentioned advantages, the key of ZigBee RF4CE is the low latency. Almost everyone knows the experience of pushing a button, nothing happens, pushing the button again, and something happens twice. Low latency (quick response) is a key requirement of human interface devices, like remote controls, where instant feedback (in less than 10 milliseconds) is paramount for a good user experience. RF4CE was originally developed in 2008 by the TV makers (Panasonic, Philips, Samsung and Sony). In 2011, RF4CE was adopted by the ZigBee Alliance and since then, it has been greatly refined in particular by the MSO’s to meet their requirements as well as improve the end user experience. Under the umbrella of the ZigBee Alliance, the RF4CE protocol (under ZRC 2.0) supports the ZigBee 3.0 command set, so it is possible to control many different Smart Home applications (lights, thermostats, sun shades, etc.) from a standard RF4CE remote control, making the remote control part of the standard Smart Home infrastructure. ZigBee RF4CE supports both ZigBee PRO and Thread (IPv6) as a networking protocol, whichever is used in the home. Device and system developers worldwide now have the opportunity to create new products and technologies that, via RF4CE remote controls, can become part of the ZigBee based Smart Home networks that are being rolled out by the major operators. Since the initial specification in 2008, over a hundred million set-top boxes and remote controls are already using RF4CE worldwide, resulting in a very mature offering. Another common question is: with WiFi and ZigBee RF4CE in the same set-top box, does this create major interference problems? The answer is: no. ZigBee RF4CE has been developed in such a way that possible interference problems with WiFi are eliminated. Mechanisms for this include proper channel setting and the so-called frequency agility, where the set-top box remote control application automatically decides to switch to another channel, when the performance in one channel would not meet quality of service. What about Bluetooth & BLE? Another common question is whether Bluetooth should be used for the RF remote control instead of RF4CE. The primary argument is that most smart phones have Bluetooth already integrated, which would then enable the phone to be used as a remote control as well. Unfortunately, many of the TV-models in the market with Bluetooth remote controls are finding problems with short battery life and latency. This is because Bluetooth is a connection based protocol, where ZigBee RF4CE is a connectionless protocol. Bluetooth needs to sets up “a connection” every time it is activated after the remote control has not been used for a while. Setting up a connection – synchronizing, reconfiguring the connection parameters, and re-enabling the encryption and authentication – requires time (latency impact up to 100 milliseconds), and costs energy, leading to important reduction of the battery life (months instead of years). Whereas RF4CE energy consumption is inherently low by design (due to its connectionless architecture), the connections in BLE need to be accurately managed to get power consumptions numbers close to RF4CE. There are also practical problems. When using Bluetooth on your smart phone, how do you turn down the volume on or change the station on your TV, when you receive a phone call? How many key clicks does one have to go through (including entering the pin code) and then finding the right app? That’s quite awkward and time consuming especially when compared to just pressing a button on the remote. Remote controls are an essential home accessory and will always have their place in homes. Another important consideration is that MSO’s prefer to ship a pre-configured, pre-connected remote control together with the set-top box. In order to reduce service calls (and therefore costs) they want to make sure the user has a remote control that is guaranteed to work out of the box. Another real world challenge: suppose you want to leave for dinner with your wife but first you need to download the right app and program the baby sitter’s smart phone so that she or he can watch TV while you are gone? You are not going to want to do that. Or maybe someone in the house is borrowing your smart phone to play games or look up info for their homework? So no matter what happens with smart phones and Smart Home networks, standalone RF4CE remote controls will be around for a long time! Apart from ZigBee’s technical advantages over Bluetooth, ZigBee RF4CE has already won the remote control market. It is a mature technology backed by high volume expertise, a standards profile optimized for remote controls, used by world’s leading operators and availability from a large range of providers, which also makes it less expensive. The eco-system around ZigBee RF4CE has fully developed and has made RF4CE a mature and low cost solution. All the large set-top box and transceiver makers like Pace, Technicolor, Humax, Arris, Cisco, etc. have ZigBee RF4CE in their portfolio. The same applies for all the large remote control makers like UEI, URC/Ohsung, HCS (formerly known as Philips Remote Control), Remote Solution, SMK, etc. These companies all have complete lines of product of ZigBee RF4CE based remote controls. So, asking the USA MSO’s if there would be a way back to IR or a way forward to Bluetooth, the answer is a simple ”no”. The estimated number of set-top boxes, satellite transceivers, routers and gateways exceeds the number of one hundred million units and is growing on a daily basis. Every day, more interesting applications that rely on ZigBee RF4CE technology are developed that can be used for a wide variety of Smart Home applications. As the world is moving toward Smart Homes, ZigBee-enabled STBs will act as a central point that will control all smart devices in a Smart Home. As RF based remote controls get integrated as part of the emerging Smart Home, it opens up even more possibilities for device developers looking for unique and unfilled market opportunities. US based developers are already seeing and exploiting this opportunity. In the US, almost all operators are using RF4CE for new set-top boxes and their remotes. It is only a matter of time before other markets follow the US mass adoption. The big question now is: what is Europe waiting for?